I had some space left on a panelized PCB I wanted to etch, so I decided to fill the remaining space with a small project I had in mind. 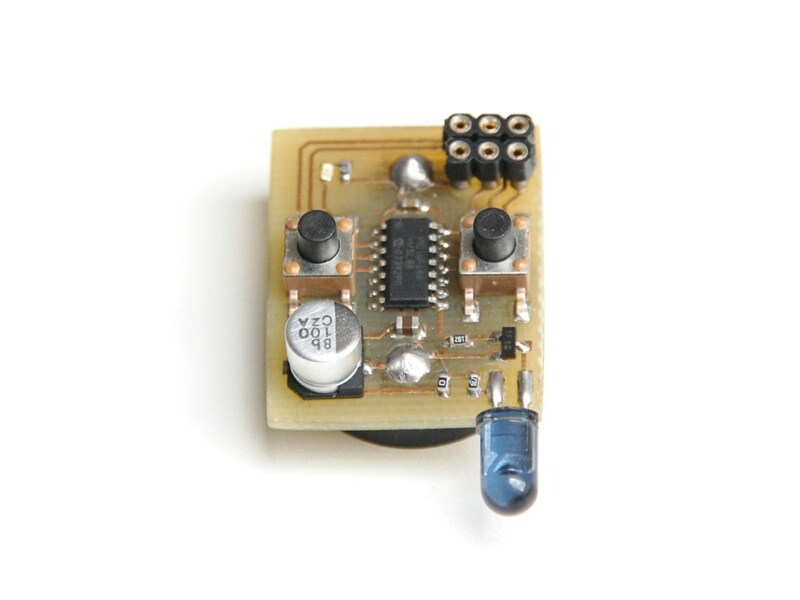 The idea was to make a small infrared transmitter, controlled by a PIC microcontroller, that could run off a single lithium cell (CR2032). The transmitter would need to have sufficient power to control appliances from a reasonable distance, and be easily operated by a couple of buttons. The pictures below show the finished remote. 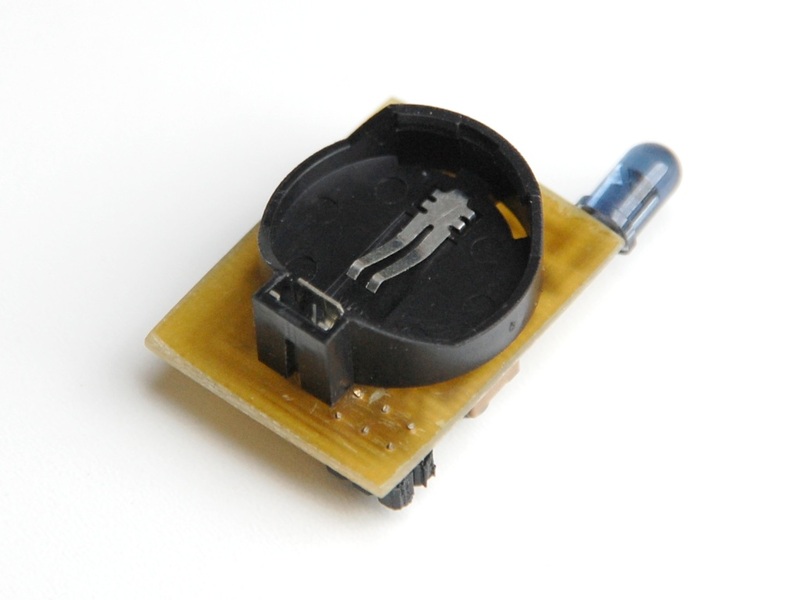 The coin cell holder and IR-LED were salvaged from an old PC motherboard and a remote control. 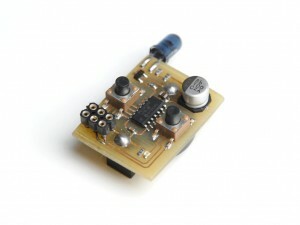 The 6-pin connector on the bottom left is used to program the microcontroller. Since it is directly powered by the 3V coin cell, a suitable programmer that can handle the low voltage needs to be used (a PICkit for example). The schematic below shows how the remote is constructed. 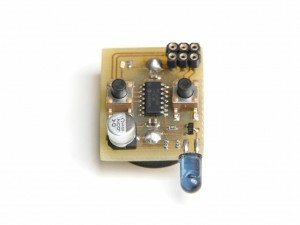 The PIC16F688 reads the two buttons and controls the LEDs. 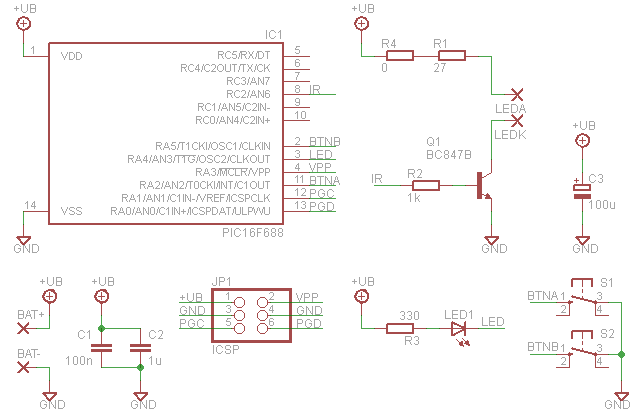 Current through the IR-LED is switched by a BC847B transistor. When the transistor is turned on, a high current pulse flows through the LED. The size of this current is determined by the value of resistors R1 and R4. Capacitor C3 is used to buffer the voltage across the LED and enable a high current flow, increasing the range of the remote. The Eagle schematic and layout files for this project can be found in the downloads section.